This scroll is from the same artist that painted the Dragon Scroll. Again, she wanted a simple scroll in the Maru Hyougu style on a Navy cloth. Very fundamental. 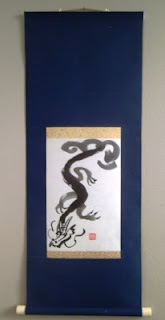 I love the gold Ichimonji on this scroll, and this is completed by the Ivory Jikusaki and the Usu Kincha Hanging String. This scroll was made for a bonsai artist. She wanted to do a painting, but decided it was too difficult to choose what she wanted for her tree. She decided to do a translation of her first name into Japanese. This is written in Gyousho or Semi-cursive style for the name Phyllis. Mrs. Lord/Master of one’s Hometown, is how I interpreted it. Yoshimi is in Japan at the moment, so I have not confirmed if this would be her interpretation of the characters. 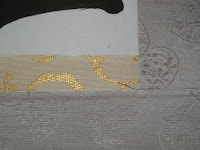 The scroll is done with a beautiful gold on cream large Karakusa (arabesque) ichimonji and a cloth that is grey/periwinkle with a purple pattern running throughout. This scroll was made for an Aikidouka. The first character is Bu, the second character is San (production or Birth) and the the last two are the characters used for Aikidou. It is completed with the light gold Hanging String and the Ebony wood jikusaki. This kakejiku is done in the Three Step Style called Sandan Hyougu. 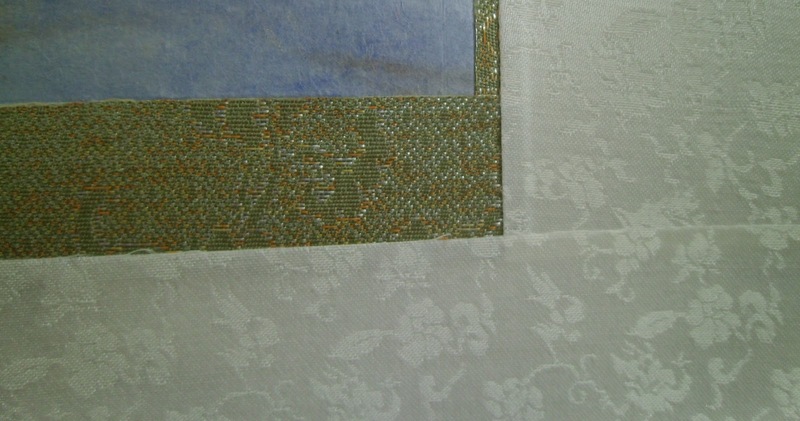 It has a Gold on Green Ichimonji with a Green Ivy Arabesque Chuumawashi and a khaki Ten/Chi. This was made for a bonsai Artist in Northern California and is already sold. If you would like a similar scroll made please contact to sales@customjapanesecalligraphy.com to work with me on designing a custom scroll. 明月秋Meigetsu no Aki is a poem or phrase for Autumn. This translation from Japanese to English is completed by Jonathan Maples from page 392 of the 禅語吉語字典 Zengo Kichigo Jiten. The general meaning is The beauty of the Autumn Moon. Because you live, you exist on the Earth. Because of that you are the master of your soul. It is through how you live that the Earth’s beauty is completed. This Zen Buddhist phrase is part of a larger scripture written 月は知る明月の秋、花は知る一様の春 Tsuki wa Shiru Meigetsu no Aki, Hana wa Shiru Issama no Haru. The moon is the symbol of Autumn, and the flower is the symbol of spring. Both know they are the beauty of their season. It is your living that witnesses the beauties of these seasons. Humans are the same. There are a diverse and many people living on the earth. Each person has their own will and individuality. Each one also has their own roles on this world. Each person reflects their beauty on this earth by carrying out their role and holding it dear in their heart. Furthermore, the fruits of this earth are gathered through the entire body of the people doing their work on this earth. The artist was kind enough to send me back pictures of some of his artwork set into the scroll and displayed with a Suiseki. I think he did a very nice job with the paintings and it gives some perspective to the size of some of the kakejiku I make.. This scroll was made for an aritst in New York City. She had two paintings sent to me to frame. Her request to was to do them very simply in the Navy cloth. 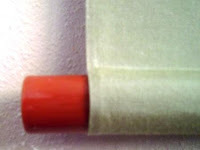 The kakejiku is a standard Hanshi size paper, which I did not trim significantly. It is completed with a Usukincha, (light gold) hanging string and the Plastic Ivory jikusaki. This small scroll was made for a bonsai artist. It is a scroll for spring, so I used the green cloth and kinka (light green) hanging string to help with the imagery of the writing. The phrase is written in Sousho style. The writing is Tenka Haru. 天下春Tenka no Haru is a poem or phrase for spring. This translation from Japanese to English is completed by Jonathan Maples from page 78 of the 禅語吉語字典 Zengo Kichigo Jiten. The general meaning is there is a great spring in Heaven and Earth. The scene of spring is a symbol of joy and growth. The heart is overflowed with feelings. A great image of Spring is etched in our mind from this phrase. The larger phrase of this is 一花開いて天下の春 Ika Hiraite Tenka no Haru. This would be translated that Spring comes under heaven on earth by the opening of one blossom. It is signaled by the beginning bud of a small plum blossom blooming. Through this small natural expression, the great spring in Heaven and Earth’s Spring is brought by a wind. We know that the plum blossom is the target symbol of spring set apart by the Japanese. Just like this small plum blossom, it is by small means that big changes are brought about. Just like these small symbols in nature are brought about on the Earth, we often do not see these small changes come about until they have already come about. Only after we see these great changes after they have occurred are we awakened to the change. Just like our spirit feels the blowing spring wind, we should in the future recognize these new beginnings before the change occurs. 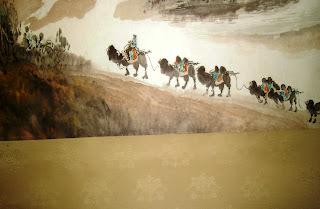 wallscroll was made for an artist that wished to hang their paintings for display. We used a very neutral earth color to help bring out the blues in the painting. 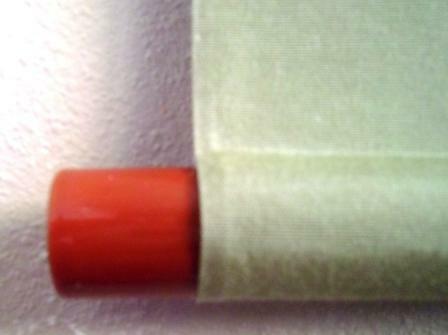 The scroll is completed with some rosewood Jikusaki (紫檀軸先) and the Kinka (金華) hanging string. This is a light green with a diagonal weave. This blank shikishi kake wallscroll was made for an artist that wished to hang their paintings for display. We used a very neutral earth color to help bring out the blues in the painting. 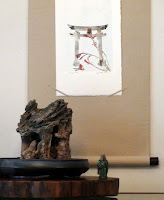 The scroll is completed with some rosewood Jikusaki (紫檀軸先) and the Kinka (金華) hanging string. This is a light green with a diagonal weave. I made this blank wallscroll for an artist demonstration. This was an interesting cloth, and I wonder what ended up to be the artists creation? This was the final scroll done for Dee Teller's solo art exhibition. It is a painting of a peacock feather titled Artists Paintbrush. I really liked the design, but had some health issues while finishing it. Particularly, some areas on the mimiori did not go perfectly. However, I really liked the design we worked out for this wallscroll. I wanted to accent the purple and gold that makes this painting so beautiful. So I wanted to use this purple gold purple pattern in a Sandan Hyougu (3 Step) style kakejiku to accentuate these colors. I finished it with a Nashi Chi Jikusaki that has a gold/red glitter look to it, whcih I felt was good for the overall design. 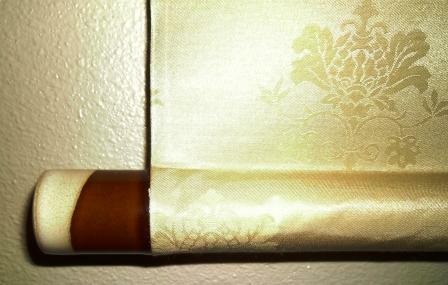 For the Kakehimo I used a deep purple with a gold pattern in it.. This scroll is a very detailed monochrome sumi painting of a pine branch. It was the 17th in a series of scrolls done for Dee Teller and her solo exhibition titled Asia Speaks. I really tried to keep this simple, but used the light green cloth (kireji) to help provide imagery of pine needles. I translated the Zenith in the title to be the Sunset, and so I used the orange/red and red lacquer jikusaki (wood ends on the bottom dowel) to try and reinforce that message. The scroll is quite small, but sometimes I think small turns out better in the end. 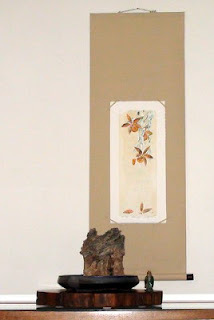 This scroll was made for a bonsai/suiseki enthusiast in California. He wanted an Enso that was larger, but I said if we wanted to use it for a display then we would have to create more whitespace for the piece. Hence the very large unpainted section at the top and middle. With the Enso near the bottom, it could compete with the main piece, but I think it actually works better to have the painting section so near to the main display piece. The scroll was done in a black cloth which is very dark, but it seems to work well with the painting. I recommended to do this scroll in the most informal Fukuro Hyougu style. 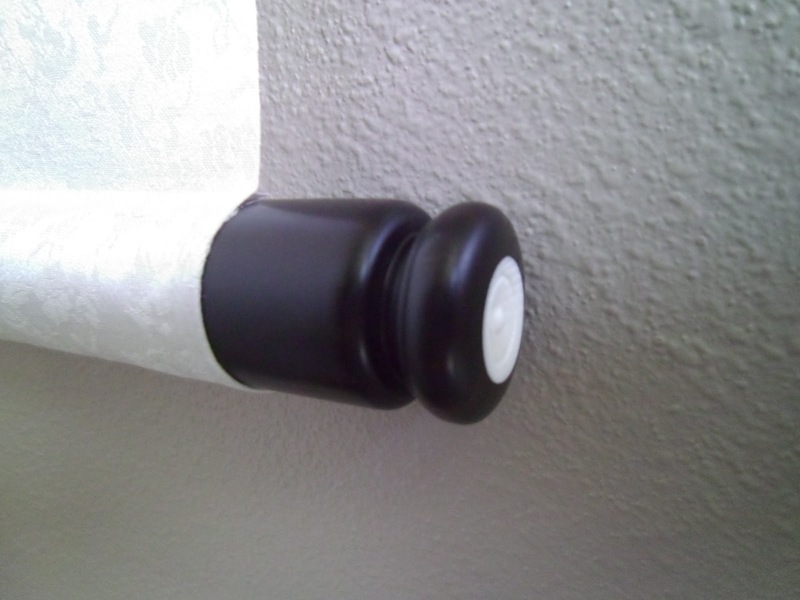 But I did two things to help spruce up the simplicity of the scroll. I placed a 0.5 bun (1.5 millimeter) red suji around the entire artwork, and then I placed three suji horizontally along the Ten and Chi of the scroll. 1 suji on top and 2 suji on the bottom. 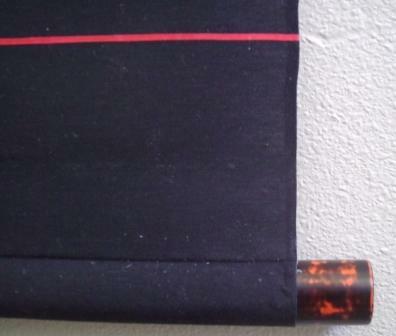 The scroll is then completed with the Akebono style wooden jikusaki. This mixes a black and reddish orange lacquer over the wood. It is completed with the Kogecha (Navy/Dark Brown) hanging string. 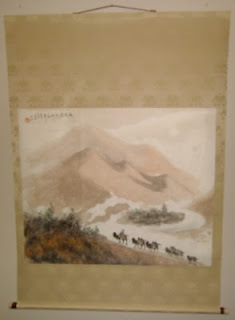 This wallscroll was made because this customer purchased an artwork in China. I really have grown to love this scene because of the many different shades of brown used throughout the artwork. I have never quite seen a painting like this and do not know the original artist or provenance of the painting. When I was trying to conceptualize the cloth, I wanted to stay with a color scheme that would accent the brown colors and yet not overburden the picture. When I found this silk, I knew the pattern would be soft although it was larger, and help the viewer to stand in the desert with the camel caravan. The Jikusaki used for this was to help support both the darker shades of brown and the lighter tans in the painting. I think this two tone Ceramic jikusaki pulls this off nicely. The hanging string, or kakehimo is also unique. 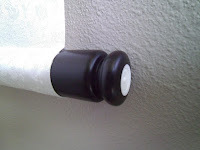 It is a three tone pattern with black, brown and tan. This is a large scroll and dimensions are as follows. This is the 16th Scroll in the series for DeeTeller’s solo exhibition titled Asia Speaks. What I really like about this scroll is the soft feel of the cloths and transition from the dark background of the painting. It is a beautiful painting, with a moon that radiates boldness, but is still soft as a backdrop to the flower. 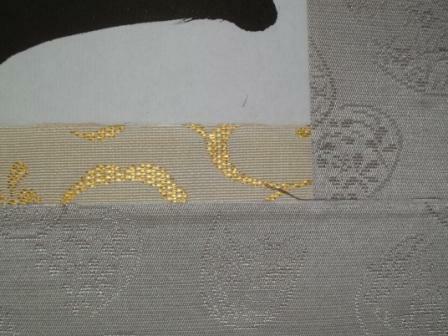 The border of this is actually ginran, which is silver filament instead of the usual gold filament thread. I actually put in on backwards to have a more muted design. 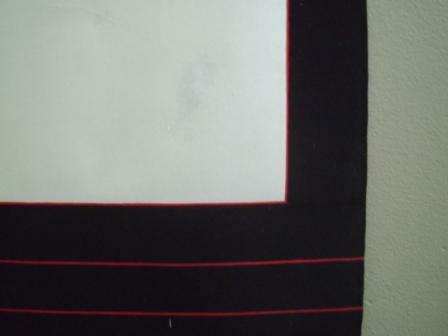 You will also notice that there is about a 1.5 millimeter piece of the ichimonji that borders the artwork. The white cloth with the small karakusa (arabesque) is a nice fit for the scroll. Above you can see the beautiful ebony wood jikusaki that has bone inserted into it. This really is quite beautiful with the blue of the painting. In fact one can see this scroll in the background of the link. Dimensions of the scroll listed below.